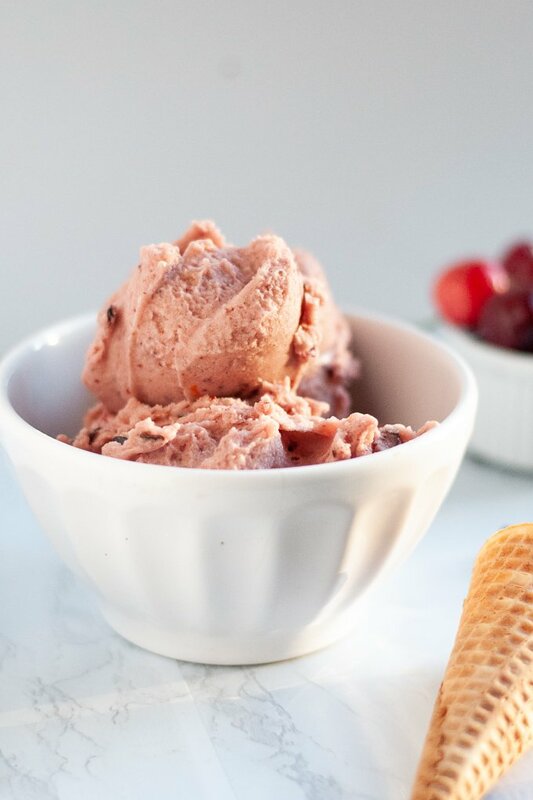 This creamy vegan ice cream is made in a food processor or blender using just 5 ingredients: bananas, cherries, chocolate, soy milk, and almond extract. Nice cream is beyond easy to make. 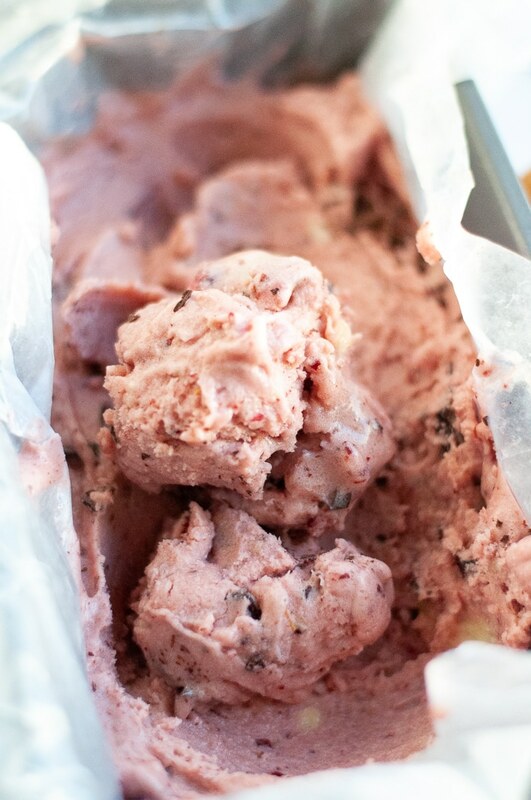 No churn required, just a food processor (or blender) and a freezer. If you’re like “What in the world is nice cream? !”, just let me explain. 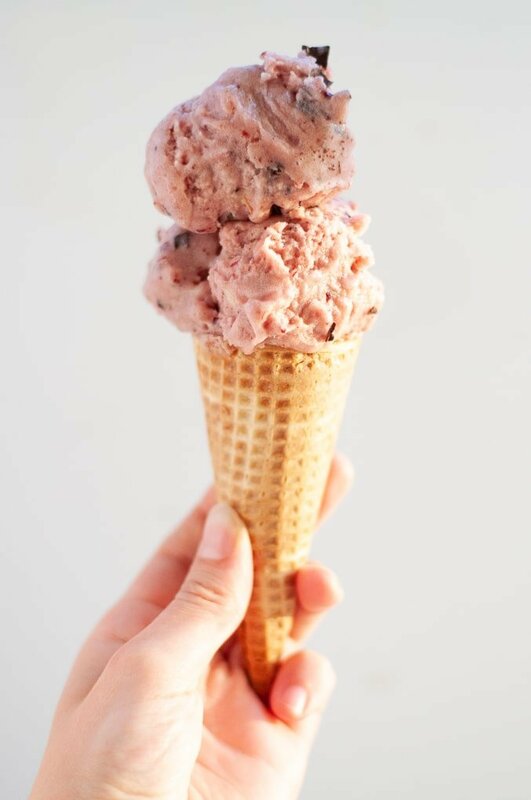 It’s a dairy free ice cream with no added sugar that’s made using a base of ripe bananas, which means it’s vegan friendly and lactose intolerant friendly. Isn’t that nice(cream)? 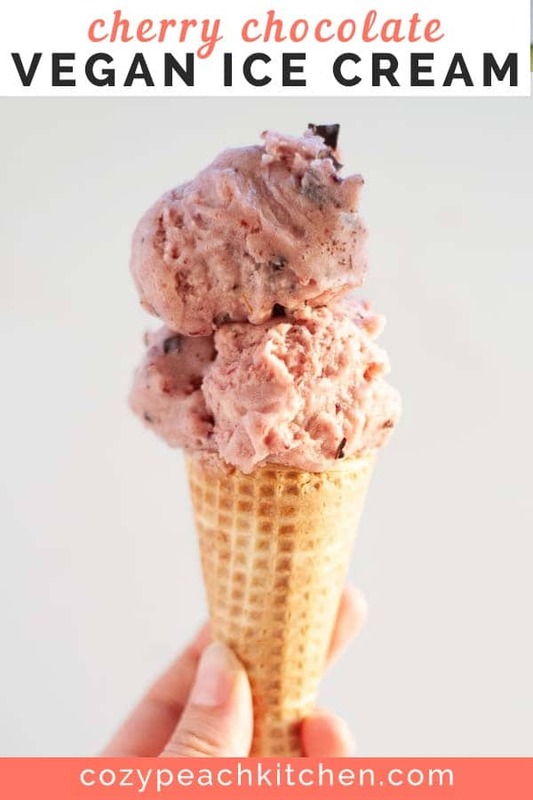 It takes just five ingredients to make this refreshing vegan ice cream. Seriously! It’s too easy. Let’s unwrap the main ingredients one by one. I used to hate bananas. I wouldn’t touch them with a ten foot pole. And let me tell you, it’s annoying to dislike bananas. They’re just so convenient and they seem to be everywhere. 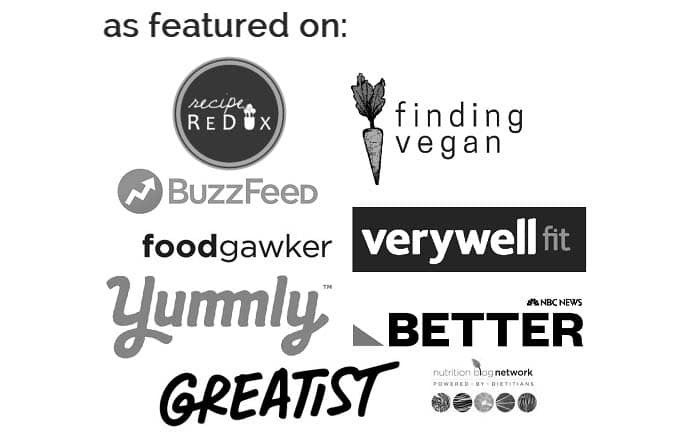 So, at some point (last year) I said “What the heck!” and devoted myself to trying bananas. Here we are a year later and I’m so okay with bananas that I’m scarfing down banana nice cream left and right! Why use bananas? 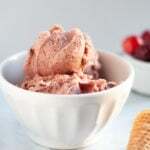 Bananas make this cherry chocolate ice cream sweet using no added sugar! How’s that for a healthy snack? Like most fruit, bananas get sweeter and creamier as they ripen. That’s why I recommend using super ripe bananas (black speckles on the peel are a good reference for sweetness!) for nice cream. 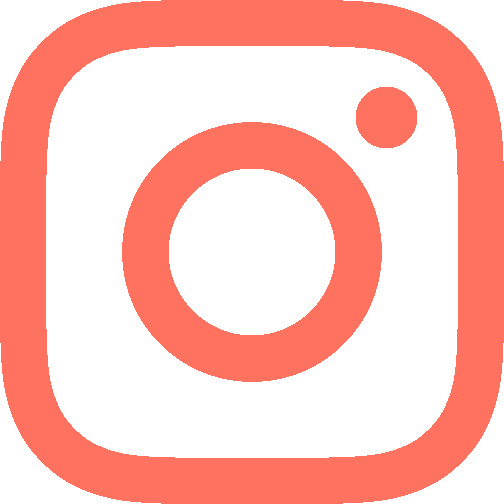 Another personal note: I. Love. Cherries! And I only just tried them for the first time last year, thanks to the PNW being loaded with inexpensive, delicious cherries. The secret to this recipe? I use frozen cherries. They’re available year round, frozen at their peak ripeness (sweet & loaded with nutrients! ), and less expensive. Not to mention they’re already frozen, which makes it much easier to blend up the nice cream. Ingredient #3 is almond extract, which isn’t required, but it is a great way to enhance the cherry flavor. Another option is to chop up almonds and add them in with the chocolate. I use about 2 ounces of a chocolate bar (that’s two squares, if you’re using baking chocolate) and cut it up into varying sizes. Roughly chopping the chocolate makes flakes, chunks, and chocolate dust. This means more chocolate and texture in every bite! 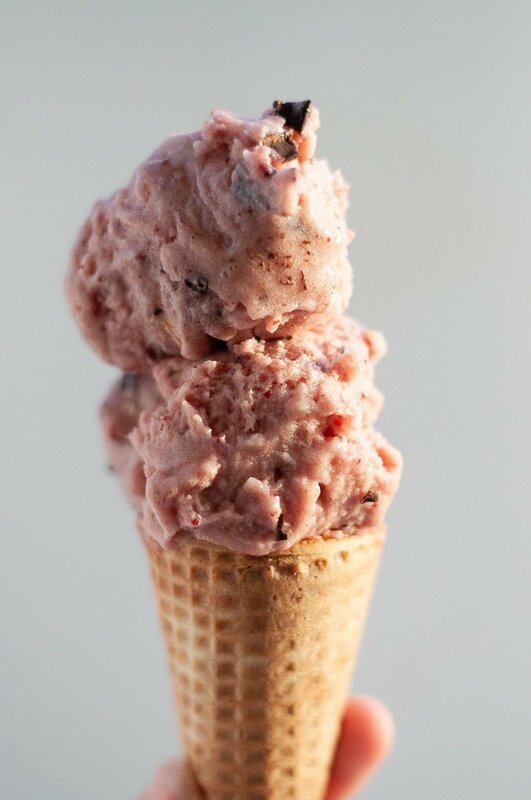 I have some cherry chocolate nice cream in my freezer, waffle cones in my pantry, and a smile on my face. Hello summer!! 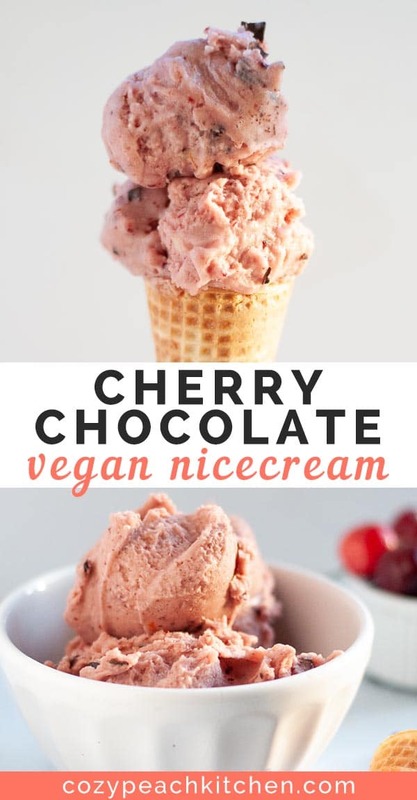 Make this vegan cherry chocolate nice cream in 5 minutes using just bananas, cherries, chocolate, and a splash of soy milk. Slice up four ripe bananas (the riper the better!) and freeze for at least two hours prior to using. If using fresh cherries, freeze them for at least two hours with the bananas. Chop up the baking chocolate into varying sizes of chunks and flakes. Set aside. Add the frozen bananas, cherries, and almond extract to a food processor or high powered blender. Process until smooth, adding milk one tablespoon at a time if the mixture is too thick. It should be thick and creamy, not runny. You may not have to use all of the soy milk. Line a bread tin with parchment paper. Another similar sized tin will work if you don't have a bread tin. Spread the nice cream into the tin in 3-4 different layers. Sprinkle each layer with chocolate between layers. Serve immediately, or freeze for 30 minutes for a more solid nice cream. *Choose the chocolate percentage based on your preference. The nice cream is already pretty sweet, so I usually go for a chocolate bar that is >80%. If the bananas you're using aren't super ripe, you may want to go for a lower percentage, like 65%. This ice cream is amazing! I followed the recipe exactly and it turned out sweet, super creamy, and the perfect amount of tangy (from the cherries)!